If you enjoy welding or working with other tools such as drills, screwdrivers, and other metal-tipped tools, consider adding a bench grinder to your workshop. Bench grinders admirably perform a number of functions to metal: shine, buff, sharpen, clean, or polish. Bench grinders suit almost any type of hobby or job such as painting, plumbing, automotive bodywork, carpentry, and others. This versatile and flexible tool should have a prominent place on your workbench. In this article, we share some of our favorite bench grinders that combine functionality, features, durability, and value! Then, we’ll detail some things to consider when researching a bench grinder to purchase. At the end, you’ll be well-equipped to find the best bench grinder for you! Talk about great value! The industrial-grade JET bench grinder combines impeccable construction with powerful features to clean, buff, and remove rust or burrs from metal. Although slightly more expensive than other grinders, its quality and durability will serve you well for years to come. This powerful bench grinder boasts a 1HP, single phase 115V motor with two grinding wheels – a 36-grit and a 60-grit. The motor operates at 3450 rpm. It also features enclosed pre-lubricated ball bearings, cast-iron wheel guards and dust vents, and large eye shields for safety. 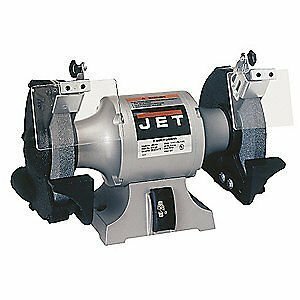 The JET bench grinder measures 19 x 10 x 12.5 in. and weighs about 60 lbs. The wheels possess an 8-in. diameter with a 1-in. thickness. The spindle comes in at 5/8 in. In addition to the features listed above, this bench grinder has a heavy-duty toggle switch and easy-adjusting spark guards. It also sits on a rubber foot to reduce movement, and you can even bolt it down to avoid as much movement as possible. Lastly, this grinder comes with a 2-year limited warranty. The package contains the bench grinder, two 8-inch wheels, hardware, and operating and assembly instructions. We love the durability, sturdiness, and versatility of this Jet grinder! This machine handles all of the heavy demands you might require in a professional environment. Built tough to endure the rigors of industrial work, we’re certain this grinder will give you years of use. Its two wheels let you tackle a wide range of projects in your home or workshop, and the enclosed ball bearings and large eye shields protect you as you’re working on those projects. It’s important to keep in mind, however, that an 8-inch wheel might be too slow or powerful if you’re just searching for a grinder to handle small jobs. Additionally, this particular model, while still a great value, comes in at a higher price point than other models. Lastly, due to its heaviness, the grinder isn’t as compact or portable as other models. 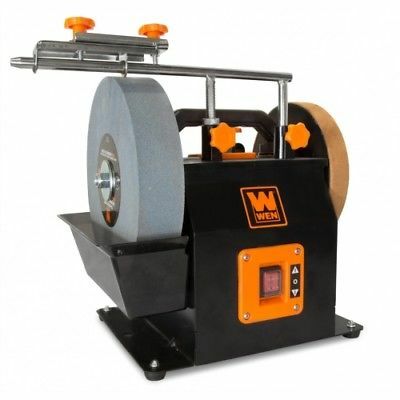 If portability concerns you when searching for a grinder, look no further than the WEN 4276 bench grinder. Not only does it tip the scale at only 4 lbs., the machine comes with an optional cast iron grinder stand (purchased separately). This enables you to move the grinder anywhere on your property or at the shop! The WEN 4726 bench grinder features two 6-inch wheels: a 60-grit wheel for general grinding and 36-grit for removing materials faster from your metal. It also comes with a sturdy base, protective eye shields, and a quiet-running 2.1 amp motor which operates at a standard 3450 rpm. This machine’s dimensions come in at 14 x 9.8 x 15 in. and weighs 4 lbs. The other useful feature of this product is the included flexible work light. This light illuminates your workspace, increasing the accuracy of your work. The bench grinder package comes with the machine and the two wheels. 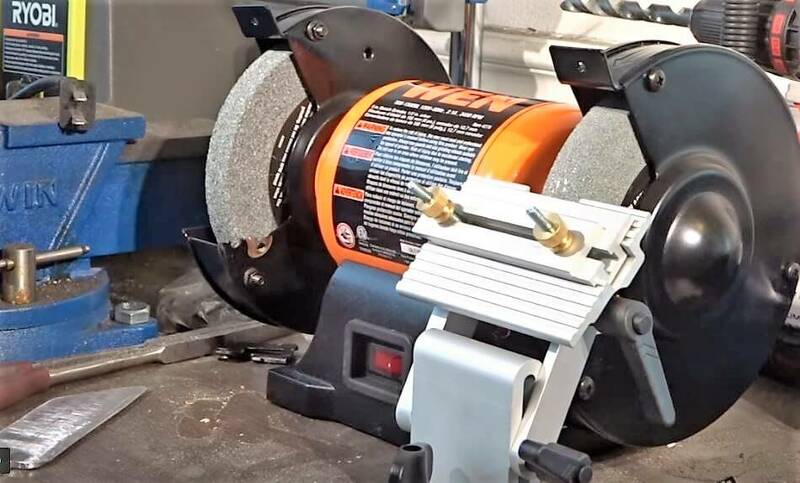 The WEN 4726 grinder is perfect for someone who needs a simple-to-use, lightweight, portable bench grinder to handle tasks such as rust removal, deburring sharp edges, and sharpening blades. Enhance this portability by adding on the 31.5 inches cast iron bench grinder stand! Take this bench grinder anywhere and use it anywhere! The work light adds enhanced usage in less-than-ideal lighting situations as well. This is perhaps one of the best values you’ll find for a 6-inch bench grinder! Keep in mind, however, that this grinder may not handle more industrial projects. The WEN grinder also works well for occasional, light use, rather than every day, constant use. Consider investing a little more money into something more durable and heavy if you require regular use out of your bench grinder. 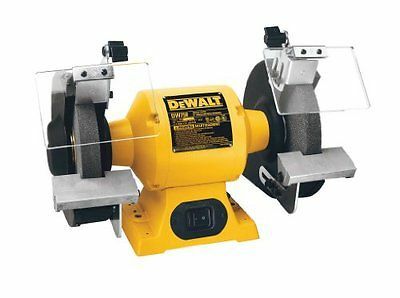 Durability and sturdiness define the Dewalt DW758 bench grinder. Made with cast iron and aluminum parts, this bench grinder promises a long and powerful life. The Dewalt DW758 can withstand industrial-strength projects and regular use, so it’s well worth the investment! The cast iron base and motor housing and the aluminum tool rest provide enhanced durability. It also features two 8-inch wheels: a 36-grit one and a 60-grit one. The DW758 runs on a 3/4 HP induction motor and runs at a rate of 3600 rpm, a little higher than the average grinder. This machine measures 17.8 x 12.6 x 10.8 in, and it weighs about 40.5 lbs. The DW758 comes with overload protection that prolongs and maximizes the motor’s longevity. The aluminum tool rests help you position your work for more accurate grinding. The 12.5 inches between the wheels allows for longer and larger grinding sessions. 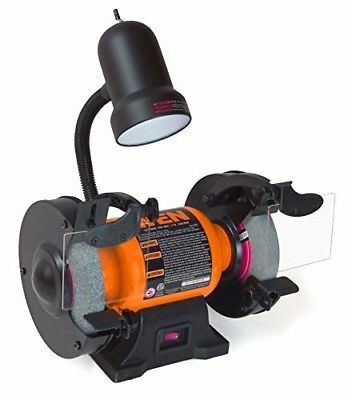 The packing for this product includes the 8-inch bench grinder, 36- and 60-grit wheels, eye shields, spark deflectors, tool rests, and operating instructions. This bench grinder is an excellent, affordable machine if you’re looking for something to work on industrial-type projects! Its cast iron and aluminum construction offers enhanced durability and solidity so you can use this grinder for years to come. The 12.5 inches between the two wheels ensure you can work on larger pieces of metal as you need to. This grinder also comes with a 3-year warranty against defects. Unfortunately, some users have reported that the machine vibrates heavily when in use. This could impact some of the accuracy as you’re grinding. Some mention bolting the grinder down to alleviate this. Are you looking for a grinder specifically suited for sharpening? 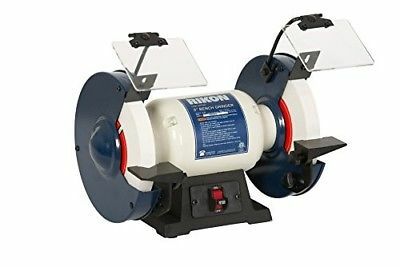 Then look no further than the Rikon 80-805 Slow Speed Bench Grinder! This grinder is perfect for sharpening due to its ability to reduce heat. Its durability and its value make it an attractive tool to add to your collection. This grinder features two wheels, like most other grinders: a 60-grit wheel and a 120-grit wheel. These wheels differ from other ones due to its material – white aluminum oxide. The body is also constructed with a cast iron base with anti-vibration rubber feet. The Rikon 80-805 runs on a 1.2 HP motor at approximately 1750 rpm. The Rikon 80-805 comes in at 16.4 x 10.8 x 11.2 in., and it weighs about 37 lbs. Adjustable safety eye shields and spark resisters top the list of security features this grinder has. The packaging comes with the grinder, the wheels, and a dressing tool. Slow speed grinders work well for sharpening wood and perhaps some metals. This slow speed grinder offers durability, tough wheels, quiet running, and anti-vibration feet for the best possible accuracy for your projects. This grinder provides a fairly frictionless experience and works well for casual projects around the house. It might not be suitable for heavier projects. Although a highly-rated grinder, sometimes the grinder wobbles or the anti-vibration rubber feet do not work. This occasionally occurs even if the grinder is bolted to a surface. The WEN Two-Direction Wet/Dry Sharpening System serves as one of the best sharpening systems on the market today. Versatility defines this machine with its options to sharpen metal and wood. It has a sharpening stone, and a leather-stropping stone used to polish and straighten blades. This all-in-one tool is a must-have if you need a sharpening tool. The WEN 4270 has both a sharpening stone and a leather-stropping stone. The sharpening stone measures 10-inches with 220-grit, and the leather-stropping stone is 8-inches in diameter. Universal jig support enables a myriad of accessories to be used with this machine. The Rikon WEN 4270 comes in at 17 x 10 x 14.5 in., and it weighs about 36 lbs. Easily reverse the direction of the sharpening stone to fit your changing project needs! All you need to do is flip a switch! The packaging comes with the grinder, an onboard carrying handle, an angle guide, a honing compound, an adjustable water reservoir, and a knife-holding jig. This grinder is the perfect accessory for sharpening tools. Not only can you sharpen your knives, blades, or tools, you can use the leather-stropping tool to straighten and polish your work. Also, its universality allows it to be used with a variety of accessories. Lastly, the carrying handle lets you bring this tool wherever you might need to – your home, your shop, or even your business! The sharpening stone is a bit soft and might require dressing after a while. Also, you might encounter some wobbling in the wheel. Something else to keep in mind is that this grinder is meant to sharpen, not to reshape the taper on your tool or blade. This versatile tool performs all of the functions you could ever want: grinding, sharpening, buffing, and polishing. The Delta 23-197 offers variable speeds between 2000 rpm and 3400 rpm. Its cast iron base increases the grinder’s durability and sturdiness! 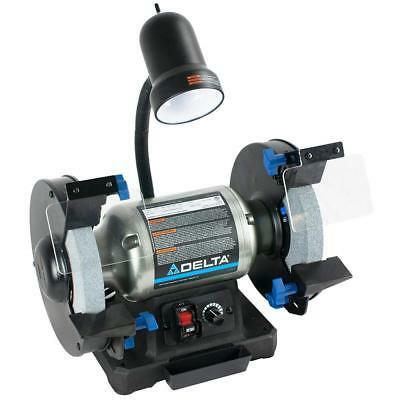 The Delta 23-197 8-inch grinder features two wheels: a 36-grit wheel and a 60-grit wheel. It runs on a 5 amp induction motor and runs on speeds ranging from 2000 rpm to 3400 rpm. The cast iron base reduces vibration, and an included water tray keeps your project cool. The Delta 23-197 comes in at 9.5 x 14.5 x 16.5 in., and it weighs about 46 lbs. This grinder boasts a two-piece tool rests so you can obtain the correct angle for your project. Also included is a flexible work light. The packaging comes with the grinder, the wheels, and a power cord. If you’re looking for an all-in-one, value-added grinder, look no further than this one! The durable Delta 123-97 will easily perform all functions you’re hoping to accomplish! The cast iron base increases its sturdiness, and the flexible light helps you to get a more accurate grind. Finally, vary the speed of your grinder with the simple turn of a switch! Unfortunately, after some use, the stamped metal washers used to clamp the wheels appear to be of low quality and may cause the wheels to wobble. The light also might have issues staying in position for too long. An all-in-one machine perfect for grinding, sharpening, buffing, and polishing. 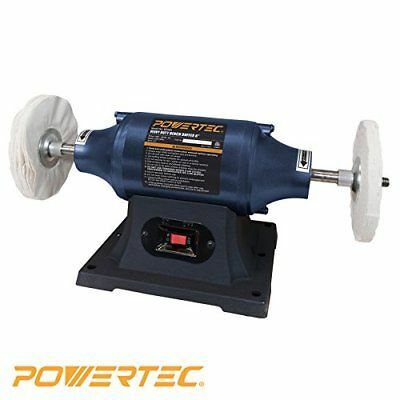 The Powertec BF600 grinder makes polishing and smoothing metal and other materials simple and effective This lightweight tool is portable, powerful, compact, and a great deal if you’re looking to purchase a buffer without additional functionality needed. This grinder runs on a powerful 1/2 HP, 120V induction motor for reliable performance. This assists in the machine’s smooth operation of buffing tools, metal, and other items. A cast iron base reduces vibrations in operating the grinder and extends the machine’s longevity through increasing its sturdiness. The Powertec BF600 measures 20 x 10 x 9 in., and it weighs about 20 lbs. The packaging contains the grinder, two buffing wheels, four flanges, and two nuts. The Powertec BF600 works remarkably well to smooth and polish copper, silver, knives, handles, and other metal objects. It can also be used for sharpening small objects. The machine is heavy enough to withstand vibration, and you do not need to bolt it down to a workbench. Constructed with robust, quality materials at an outstanding value, you’ll be able to use this for years on end! One downside is that this does not offer variable speeds. Also, the wheels are not soft enough to work on paint – if you try to buff paint, you might burn it. Who Makes the Best Bench Grinder? Who makes the best bench grinder depends on which functionalities you’re searching for. Some of the prominent manufacturers in the market include Craftsman, Wen, Dewalt, and Jet. If you’re new to bench grinders, we especially recommend going with a manufacturer who offers a good warranty. This way, should something go wrong, you’ll be covered! Our favorite bench grinder on this list is the JET 577102 JBG-8A 8-Inch Bench Grinder. Despite the fact the price point comes up a bit higher, this offers the best combination of value and features from a well-known, well-respected brand. What Is a Bench Grinder Good For? A bench grinder performs a number of functions including sharpening, cleaning, buffing, polishing, and shaping metal or wood, depending on the wheel placed on the grinder. They’re versatile, often well-constructed, and work for a large number of projects. Some bench grinders work well with smaller projects such as house repairs, and others work for more industrial projects! How Should the Tool Rest on a Grinder Be Adjusted? 1) Determine the angle needed for your grinding. Mark the angle on cardboard with a protractor, and cut to make an angle gauge. Should Gloves Be Worn When Using a Bench Grinder? Although you should certainly get the most powerful grinder you can afford, keep in mind your purpose for using a grinder. If you’re looking for a versatile, all-in-one machine, then consider purchasing a grinder which supports a wide range of wheels or accessories. If you’re looking for a specific purpose, such as buffing or sharpening, then consider buying one of those more specialized machines instead. This way, you might be able to save money! It’s easy to want to purchase the cheapest model to get a job done. However, we recommend purchasing something you know will stand the test of time. Bench grinders made with durable materials such as aluminum or cast iron will be more likely to last you. This way, you don’t have to regularly purchase a new bench grinder each year. Ensure that the wheel you’d like to use compliments the bench grinder you choose to buy. Not all wheels are compatible with all grinders. Choose the grinder which supports the wheels you’d like to use. Motors power the bench grinders – find the bench grinder which aligns with the metals or materials you’ll want to use. Choose a more powerful motor for larger metals or projects. Otherwise, you might find yourself needing to purchase a new grinder if your motor power is insufficient to tackle your jobs. Think of how often you’ll use the grinder. If rarely, consider purchasing a standard model with just enough features to accomplish your objectives. If often or if you’re grinding complex items, consider upgrading to a more expensive, durable model that can handle industrial-strength jobs. 6-inch (Regular Speed) and 8-inch (Slow Speed) grinders form the two primary forms of bench grinders. 6-inch grinders work well for pretty much everyone. They move at regular speeds and function well for most projects including home improvement and repairs and operate quietly. 8-inch grinders run at slower speeds and work for most professionals or more advanced users. In this article, we reviewed some of our favorite bench grinders and provided a buyer’s guide with some additional information on what you should consider when buying a grinder and some tips to keep you safe! We hope this found this article useful and wish you the best of luck in your search! I hope you found our Best Bench Grinder article useful. Do you have any other questions about any other Bench grinder brand?